Having done all that it could with the original set-up, season eight of Curb your Enthusiasm switches things up to help provide some fresh settings and scenarios for Larry David. Occasionally this is successful and awkward humor prevails, though the strength of this show has diminished some from earlier seasons. 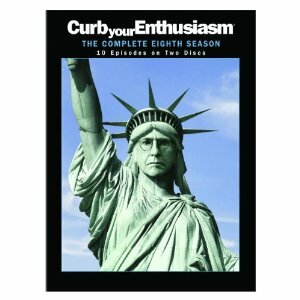 Even returning the native New Yorker to his hometown isn’t enough keep Curb your Enthusiasm as strong as it once was, but a variety of convincing cameos are what end up carrying season eight. Beginning with a divorce, season eight frees Larry David up to date once again. The single scene is uncomfortable enough without the help of Seinfeld creator Larry David’s patent social awkwardness, making a predictable mess and reliably full set of new situations for season eight. To help matters along even further, Larry moves to New York temporarily in order to avoid helping out with a charity function. New York provides all-new social situations to analyze and sabotage, from catching a cab to watching a Broadway show, though it is the cameos which help carry the season. Fellow comedian of discomfort Ricky Gervais (“The Office” and “Extras”) bumps egos with David, whereas Michael J. Fox has a battle with Larry in the final episode of the season. These cameos bring welcome new elements to the storyline, which is helpful when his dating life situations quickly grow stale. Though season eight is nowhere near as funny or smart as the first few seasons of the show, it is a welcome return with many new elements attempted. Being a bachelor and in New York City helps, though there are still a few bad episodes in the bunch. Season eight includes ten episodes on two discs, as well as a few special features. The bonuses include a roundtable discussion with Larry and the cast in New York, as well as Leon’s guide to NYC.